Dinoxyline is a synthetic compound developed for scientific research, which acts as a potent full agonist at all five dopamine receptor subtypes. ^ Grubbs RA, Lewis MM, Owens-Vance C, Gay EA, Jassen AK, Mailman RB, Nichols DE (March 2004). 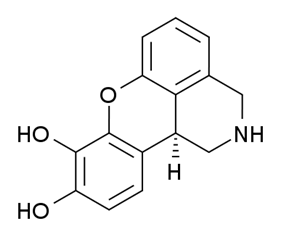 "8,9-dihydroxy-1,2,3,11b-tetrahydrochromeno[4,3,2,-de]isoquinoline (dinoxyline), a high affinity and potent agonist at all dopamine receptor isoforms". Bioorganic & Medicinal Chemistry 12 (6): 1403–12. ^ Ryman-Rasmussen JP, Nichols DE, Mailman RB (October 2005). "Differential activation of adenylate cyclase and receptor internalization by novel dopamine D1 receptor agonists". Molecular Pharmacology 68 (4): 1039–48. ^ Zhang J, Xiong B, Zhen X, Zhang A (March 2009). "Dopamine D1 receptor ligands: where are we now and where are we going". Medicinal Research Reviews 29 (2): 272–94.